Can Tennis Strings Hurt Your Game? Can tennis strings physically hurt you and your tennis game? The answer is yes. Most tennis players attribute their arm injuries to their tennis rackets; however, this is only half true. The tennis strings that you put into your racquet to play with can hurt your game and even cause arm injuries. Knowledge is powerful and a lack of it is a disaster waiting to happen. Unfortunately, the uneducated local tennis community and those who manufacture tennis equipment promise tennis players “more power and spin.” Can we achieve both without a cost? Or is “power and spin” the Holy Grail of the tennis court? Power and spin can be accomplished through the right string set up. However, due to a lack of knowledge in the tennis racquet stringing department, many tennis players are hurting their game with the wrong string set up. Mostly, this damage comes from a type of string called Polyester. The equipment providers and tennis community have been on a 10-year binge promoting this category of strings, but they are not designed for the recreational or club level tennis player. The home stringer and local teaching professionals also recommend Polyester Strings to all tennis players instead of the few. Polyester Strings are designed for high level tournament players and professionals on tour. Why? Polyester Strings have a short playing window at maximum playability. Each string type (Synthetic Gut, Multifilaments, Polyester and Natural Gut) play best for a certain amount of hours and then the playability diminishes, just like a tennis ball. For example, we at Grand Slam Tennis find that Synthetic Gut and Multifilaments have a peak playing window for 30-40 hours of play; whereas Polyester Strings have a short lifespan of 20-25 hours of play. As the strings begin to lose their playability, the power and response from the strings diminish and you are forced to “muscle” the ball more to accomplish the same results as a fresh restring. This is partly why you see the tennis professionals on tour changing their racquets every couple games, or every ball change. Polyester Strings do “bite” the ball more, helping to increase the RPM’s on the ball, but you need the proper recommended tension in order to accomplish this. Polyester Strings also provide durability, but are you breaking strings every hitting session or at least once a month? If not, than this string type might not be for you. If my tennis game does not match up with these different characteristics, what string type should I use? Most club and recreational level tennis players are looking to get the most “power and control” possible out of their strings. Power, control and spin can be accomplished from Multifilament Strings and different gauges, as opposed to the trendiness of Polyester Strings. Both Multifilament and basic Synthetic Strings can maximize your power and control, but will be accomplished with feel and forgiveness as opposed to arm pain. Basic Synthetic and Multifilament Strings allow the tennis player to hit for a longer period of time with less shock, vibration and fatigue on their body. Whether you are just entering tennis or are a well-educated player, it would be in your best interest to seek the knowledge and professional advice of a tennis professional or tennis specialty store. At Grand Slam Tennis, we pride ourselves on continuing to grow and fine tune our customer profile and racquet/string records. 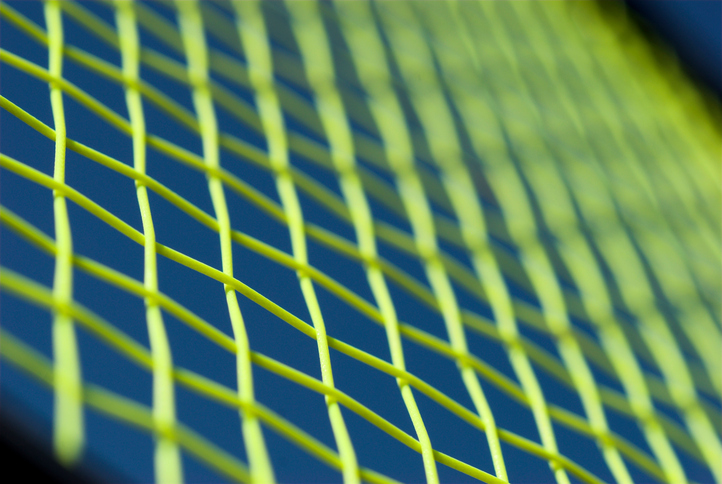 Our number one goal is to fit our customer with a racket and strings that match their ability, not the newest trend. However, as the Polyester String trend grows, so do wrist, elbow and shoulder injuries. Interestingly enough, three of the top 10 players in the world have wrist and elbow issues. Could it be their strings?